They were, without doubt, the team to beat in the ’70s. The problem, however, was that, when it really mattered, someone always did. All of the eventual winners of the 1974, 1976 and 1978 tournaments just about eliminated the Dutch on the way to glory. Those are only the raw facts though. The reality is somewhat more complex. Take the infamous 1974 final. Having rendered South American football utterly irrelevant by dismantling Argentina and Brazil on the way there, part of the game could be perceived as one of the great international displays. Having taken the lead without the Germans even touching the ball, Holland began to completely embarrass their eternal rivals. Such was the totality of the display that, unsurprisingly, it was reminiscent of Ajax’s European Cup final wins between 1971 and 73. The ultimate difference, however, was the exact dynamics of the occasion. Instead, control turned to complacency which turned to capitulation. Four years later against Argentina the Dutch were somewhat more unfortunate as Rob Rensenbrink’s effort went the wrong side of the post while they also found themselves on the wrong side of the referee. In between against Czechoslovakia they also had cause for consternation at the official’s display in their European Championship semi-final. But are three such failures coincidence are sign of a deeper flaw? Ultimately, despite proving one of the most influential and aesthetically excellent teams of all time, it all amounted to nothing in terms of tangible achievements. The team that provided the European Championship with its Brazil 1970 moment. Everything about France’s Euro 84 win screamed perfection: from Michel Platini’s hat-trick to the fluency of the ‘magic square’ midfield. Indeed, Michel Hidalgo’s inspired use of that midfield probably illustrated an ideal in team-building. By incorporating three playmakers into a balanced formation and always shifting Michel Platini to suit the game rather than specifically building the team around him, France were always fluid. But they weren’t without flaws. Indeed, to a degree, their greatest moment came in their most harrowing failure. Despite the trauma – both mental and physical given what happened to Patrick Battiston – of their 1982 semi-final defeat to West Germany, Platini described the 3-3 shoot-out settled draw as “one of the most thrilling and intense occasions” of his life. “No book, film or play could ever recapture the way I felt that night.” It summed up a team identified by epic games. To think that there was initially only doubt about this Brazil. Yet, after a chaotic 2002 qualifying campaign, they produced the most relentless tournament-winning run even that country has seen. Following a flawless World Cup in which they won seven from seven, Felipe Scolari’s squad surprisingly became the first Brazilian team to hold both that and the Copa America at the same time. In 2005 then, they added the Confederations Cup in fantastic fashion. One caveat might be that they required the initial confidence boost of a freakish World Cup. Having built up momentum in a moderate group that featured China and Costa Rica, Brazil then swept to victory thanks to Ronaldo’s remarkable redemption song. Within two years, they had regained sufficient belief to play some utterly brilliant football. A particularly high point was the 5-0 win at home to Chile. The only problem was all that quality arguably made them so complacent they exited Germany 2006 at the quarter-final. For four years they were far and away the world’s finest side. The gold medal in the 1952 Olympics heralded as much. The 6-3 annihilation of England hinted as much. And the four-year, 31-game unbeaten run proved as much. But, when it came to crowning as much at the 1954 World Cup final, Hungary fell short. That 3-2 defeat to West Germany has gone down as one of football’s great injustices. It couldn’t but given what had gone before. Of the 6-3 defeat, English centre-back Harry Johnston later said “the tragedy was the utter helplessness… being able to do anything to alter the grim outlook”. By deploying an innovative deep-lying forward in Nandor Hidegkuti, Hungary completely outthought opposition. And, when that was allied to their superior technique as well as their modern training methods, they inevitably outplayed them. Countless others felt the same as England. But, as evolutionary as Hungary’s preparation was, it wasn’t perfect. In stark contrast to West German manager Sepp Herberger, for example, the Hungarians didn’t even look at how the opposition approached games. Even the goal that finally beat them could have been prevented: the right-footed Helmut Rahn’s shift to his left had been a trademark move that any scout might have warned of. That still can’t hide the fact that Hidegkuti hit a post and Sandor Kocsis the bar while Toni Turek had to make a string of fine saves. Fortune went against them in other ways as the heavy pitch accentuated their increasing fatigue. Ultimately though, the run ended at exactly the wrong time and ensured Hungary’s golden team will always remain unfulfilled. 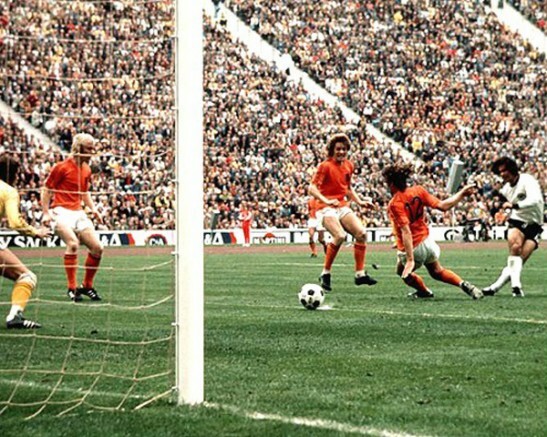 Always presented as the antagonists in Holland’s great 1974 tragedy, West Germany were – until the closing stages of the tournament – below their best. That form was no more than a blip though, brought on by all manner of outside issues such as disputes over payment. In truth, Helmut Schoen’s side had matched the Dutch with their own template of Total Football two years prior. Euro 72 saw West Germany produce a series of performances that L’Equipe argued had “no equal in Europe”. After the 3-1 victory over England, the French paper went even further: “This is football from the year 2000”. Perhaps ironically given the future that was to actually follow for the German team, that core side’s run ended when the lost the Euro 76 final to Czechoslovakia on penalties. Even in that game, though, the Germans had shown their resolve as they came from 2-0 down to force a 3-3 draw. In the 1974 tournament, too, Franz Beckenbauer had finally managed to rally the squad after a dire opening group. Effectively taking on the role of manager from the exhausted and exasperated Schoen, the Germans “willed themselves into playing decent football through determination”, as Uli Hesse wrote. It represented the high-point of the most sustained period of tournament progress Europe has seen, with the Germans only losing two competitive games in six years. That was a heroism the Dutch just couldn’t get near.